Charlotte is half British, half Icelandic, but grew up in South Africa, Texas, Norway and Scotland. 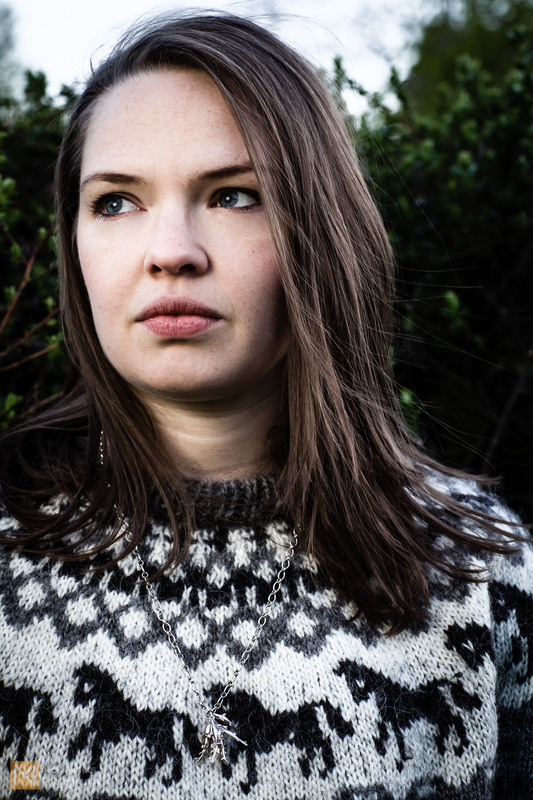 After university she went to Iceland for the first time to connect with her Icelandic roots and ended up spending almost 6 years there – the longest time she had spent in any country. She married an Icelander (Bjarni) and ironically it was because of him and his studies that she moved back to the UK. After a short stint in Bristol, they found themselves in London, and after the initial six month adjustment period embraced all that the city offered. The shark necklace was a present from her husband a few years ago (after some serious hint dropping) and is made by the Icelandic designer Hringa. Bjarni says that the animal Charlotte most resembles is a shark, though only when angry. Along with her collection of lopapeysur, her necklace reminds her most of Iceland. The lopapeysa in this photo was made by her mother in law and gets the most wear of any in her collection.